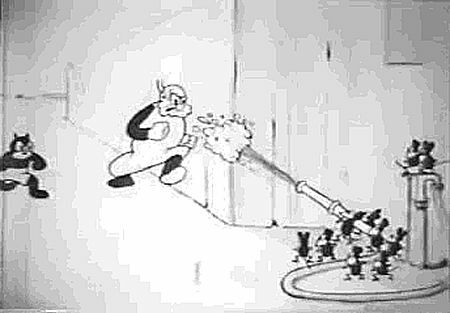 When television in New York was brand new, children’s programming included countless hours of silent cartoons featuring Farmer Gray (or “Farmer Al Falfa”), originally made in the 1920’s and 30’s. Among other problems, Gray and his cat faced the Sisyphean task of ridding the farm of mice, thousands of them. Nothing availed: after dumping the mice in the lake, Gray would return to the farm, turn on a faucet, and out would come — mice. I am intensely focused on this issue and the region because it is vital really to American interests and regional interests to try and advance the peace process and because this festering absence of peace is used by groups everywhere to recruit and encourage extremism … Both sides mistrust each other deeply and there are reasons that mistrust has built up. I am convinced that we can break that down. “The festering absence of peace” is actually festering a lot less in Israel than it is in other places in the world and even the Middle East. There is plenty of festering non-peace going on in Egypt, which is spiraling out of control, where churches are attacked and Christians murdered, and where there will soon be starvation as the nation’s food and currency run out. There is also a lack of peace festering in Syria, where the death toll of the civil war is conservatively estimated at about 60,000, where chemical and biological weapons are at risk of falling into the hands of terrorists, and where one of the major opposition groups has just announced that it is joining up with al-Qaeda. There is also the very serious danger that the peaceless festering in Syria will cause Lebanon and Jordan to fester peacelessly as well. And don’t forget the absence of peace in the Korean peninsula, which could begin to fester massively at any moment. These are all much more urgent if regional and world peace is one’s concern. Islamist groups and governments, along with radical Arab nationalists, Iran, and others, are determined to prevent any resolution of the issue. Anything other than Israel’s extinction they hold to be treason. If—and this isn’t going to happen—Israel and the Palestinian Authority made a comprehensive peace treaty those forces would double and triple their efforts to subvert it. The government of Palestine would face determined domestic opposition, including assassination attempts on the “traitors” who made peace. Palestinian factions would claim to be more militant than their rivals and would seek to use the new state as a basis for attacking Israel in order to prove their credentials and advance their political fortunes. What would the government of Palestine do once cross-border attacks inevitably began against Israel? It is highly likely it would disclaim responsibility and say they cannot find those responsible or even proclaim that these people are heroes. Of course, the Hamas regime in the Gaza Strip would not accept the deal, thus ensuring that it could not be implemented. That last factor, which is a huge and impassable barrier is simply ignored by the “peacemakers.” Israel would have to make major territorial concessions and take heightened risks in advance that would bring zero benefits from a Hamas government that would increase its attacks on Israel. Hamas forces on the West Bank, perhaps in partnership with Fatah radicals, would seek to overthrow Palestine’s government. There would be attempts to carry out atrocities against Israeli civilians to break the deal, just as happened by Hamas alone during the 1993-2000 “Oslo peace process” period. Hizballah from Lebanon would also increase attacks on Israel to prove that the treasonous peace could not hold. The ruling Muslim Brotherhood in Egypt and Syria would do everything possible to help Hamas. There would be outrage in large sectors of public opinion and especially among the armed Islamist militias who would try to lever their countries into war, stage cross-border attacks against Israel, and back Palestinian insurgents. Of course, the fact that they understand all of the points made above is one of the main reasons why the Palestinian Authority’s leadership isn’t interested in making a peace deal with Israel, and not even negotiating seriously toward that end. Ironically, then, the recruiting and encouragement of extremism would be at far higher levels than it is now. Notice that Kerry, like all past American meddlers mediators, conflates ‘peace’ with an Israeli-PLO agreement that results in Israel withdrawing from the territories. But a piece of paper is a piece of paper. There is a fundamental problem that no possible Palestinian Arab leadership will accept the idea of a Jewish state, and will immediately begin trying, by force and diplomacy, to overthrow it. A withdrawal will only make it easier. What American interests and regional interests is he talking about? I suppose the ‘regional interests’ are those of Turkey and the Arab states. Obviously, whatever is bad for Israel is good for them. American interests ought to include a strong, democratic ally in an area where anti-Americanism is the rule. Instead, Kerry seems to perceive these interests as placating the Saudis, and more recently, the Turks. Both of these regimes are ideologically enemies of the democratic West — and, unlike Israel, they have never supported US actions unless they directly benefited from them. Finally, there is the mistrust that he believes he can break down. This implies that the issues are not substantive, but flow from misunderstandings developed over the years. But the mistrust on the Israeli side comes from years of terrorism, war, rocket bombardments, etc. It’s very concrete and quite reasonable. And the Arabs mistrust the Jews because they are ‘occupying Arab land’ and have been doing so since 1948 and before. There is only one thing that could change that, and Israel’s Jews are not prepared to move to Poland. Either Kerry believes his statement, which means he is incompetent, or he understands all of the above and has different motives (which makes him a liar). Maybe he simply wants to carry on the State Department policy, established in the mid-1970’s as a response to the Arab oil weapon, to shrink Israel to 1949 size regardless of the consequences. This entry was posted on Wednesday, April 10th, 2013 at 11:12 am and is filed under General. You can follow any responses to this entry through the RSS 2.0 feed. Both comments and pings are currently closed. Vic’s last sentence: BINGO! But not for the reasons one usually cites. This really is not, as it was in the 70s/80s, about oil politics, at least not as it was understood at that time. First, we really don’t need their oil. The Gulf Arabs led by Saudi Arabia is a distant third among foreign sources of U.S. oil, well behind Canada and Mexico. With newly discovered resources here at home accessible by new technology such as fracking (that Obama is throwing regulatory road blocks in front of at every opportunity….Hmmmmm), and enhanced supplies from other sources (i.e., the Keystone pipeline from Canada, that Obama is trying to deep six, coming up with new excuses for delaying a decision all the time…Hmmmmmm), we could probably rid ourselves of Gulf Arab oil entirely. And, the Arabs know this. And, they have this extremely powerful lobby that, among other things, does not want to lose these income streams, and even more importantly, the political leverage this gives them with the world’s lone (?) superpower and Israel’s key ally. So, they use their stooge they’ve installed in our Oval Office to maintain at least a partial, artificial dependence on them so as to maintain at least some leverage over us, you know, just like in the “good olde days”. But that’s not all, folks. The deeper problem is that the consequences of someone like John Kerry accepting the points made by obervers such as Vic are more than they can bear. Those consequences involve, simply put, admitting Israel is “right”, and the Arabs are “wrong”. And the consequences of that mean that we should back Israel more or less unequivocally, in the same way that we back South Korea in the face of North Korea. Except that there aren’t 1.2 billion North Koreans from whom they have virtually endless pool of manpower from which to recruit people that will fly airplanes into buildings. In short, if we accept what Vic says, then we have to confront the Islamists directly . We can’t appease them by delivering Israel to them. This means, in the near term, more terrorism directed against us, with which we have to answer by effective military force. The Moslem world is poor and backward, but they are large and populous. And they have that great lobby, along with their lock on the media and academia. Given the PR “inertia” so to speak represented by these factors, and the degree to which the likes of Kerry have bought into their b.s. for so long, the “about face” we’d have to make would be quite radical. I think it is doable, but it is a very daunting prospect for the U.S. establishment. To confront the Islamist movement militarily, in an effective manner, would involve significant short-term sacrifices. It wouldn’t be as big as WW2, but it would probably involve a level of mobilization not seen since that time. We’d probably have to invade large parts of SW Asia/NE Africa, and suffer greater casualties than we have in Iraq or Afghanistan. We’d probably have to reinstate the draft. Eventually, I think we are going to have to do these things anyway, unless we are satisfied with teh prospect of winding up like the UK, pretty much an autonomous, self-governing colony of Saudi Arabia. I guess the likes of Kerry, Obama, Hagel, ad nauseaum, think this would be just dandy. The rest of America won’t. Especially after we get hit with more 9-11s, or worse, and we will. One of the most fundamental lessons of history is that appeasement never works. Another fundamental lesson of history is that it seems that nobody ever learns from it. Not only does Kerry misinterpret the situation (intentionally or from ignorance), but he intends to try and implement the Arab Peace Initiative of 2002. As pointed out on this BLOG numerous times, such a scenario would be disasterous for Israel, which would be forced to assume total responsibility for the conflict, withdraw to pre-1967 (1949 armisitce) lines to make way for an Arab “Palestinian” terror state and allow the return of millions of mislabelled Arab “Palestinian” refugees (based on an UNWRA definition), which alone would destroy the Jewish state, in return for “purported” normal diplomatic and political relations between Israel and the entire Islamic world. Failure by Israel to accept these terms, according to the Plan, would allow the Islamic world to retain the option of remaining hostile to its existence (as if under any accord or agreement it really would disappear!). As pointed out by Dr Elihu D Richter in his recent article titled “John Kerry’s plan: still missing a peace”, “this subtext rejects a self-evident principle: that Israel’s existence and security are, as Barack Obama has declared, sacrosanct” and that such a Plan “offers 100 years of dhimmitude,” at best. Actually, I’ve read that Kerry is interested in a MODIFIED version of the API. What “modifications” he has in mind, I do not know. The good news is that Netanyahu has made it plain that the PA must recognize Israel as a Jewish state as a precondition to any concessions whatsoever on the part of Israel. Obama backed him up on the recognition issue during his visit, which was the most valuable and positive thing that came out of that visit. It was a lot more than Obama was willing to do two and a half years ago, when Netanyahu demanded the very same thing in return for reinstating the construction freeze for three more months back in October of 2010. Of course, the PA – and the Arab League, for that matter – are never going to recognize Israel as a Jewish state. If Abbas did this, he’d wind up like Sadat, and he knows it. So, as long as Netanyahu stays strong, Israel isn’t going to have to give up anything, really. This will probably result in another Intifada. Obama will put maximum presure on Israel to “show restraint”, which guarantees open-ended low-level terror against Israel. If Israel takes decisive action of the sort that any other self-respecting country would take for granted as their sovereign right, Obama will use this as an excuse to “punish” Israel by various means (withdraw support for Israel in the UN, cut off defense aid, etc.). By enabling the thugs of the PA through holding Israel back, Obama’s intention is to create an environment that pressures Israel into accepting some sort of “agreement” to make the terror stop. I don’t think this will work – Israelis just are not that stupid – but that seems to be what Obama is trying to do. The larger leverage Obama has over Israel is cooperation on the matter of stopping Iran from getting nukes. That has been the traditional club Obama has used to coerce Israel into cooperating on the Palestinian issue. I suspect – I don’t have proof, this is just conjecture – that the Fordow sabotage action of this past January was effective enough that Israel demonstrated that she doesn’t really need the U.S. to stop Iran. This in turn demonstrated to Obama that he does not have so much leverage over Israel as he once thought. I think this is what led to the recent visit, and the somewhat more – emphasis on “somewhat” – pro-Israel stance taken by Obama. Obama has not changed his spots, but he is playing with a weaker hand and he knows it. Trying to force Israel into a bogus deal meant to appease Islamist sensibilities has been delegated to Kerry. I think Obama is now trying to slowly, gingerly climb down the tree of making the screwing of Israel vis-a-vis the Palestinians his top priority. It is still a priority, but I think Obama is starting to realize his limits on this issue. We shall see. It is still going to be a loooong four years. Hang in there, Noah. One thing Rubin doesn’t mention is that the day after a palestinian state is formed Lebanon, Syria, Egypt, Iraq and other Arab countries will have their palestinian population packed up and on the road “home”. A sudden influx of a million or more refugees into palestine, which has no economy and very little infrastructure is going to lead to a very unstable domestic situation. And we all know who makes the perfect diversion for Arab domestic problems. Interestingly, a PLO official — don’t remember now exactly who, maybe Abbas Zaki — said that no ‘Palestinian refugees’ would be allowed into a ‘Palestine’ in Judea/Samaria — they can ONLY ‘return’ to Israel! In my opinion, while, as you mentioned, Obama did acknowledge the >5,000 year Jewish historical ties to Israel and requested Arab recognition of it as a Jewish state, his speech was offensive, as it only criticized Israel and not the Palestinian Authority (PA). Further, to paraphrase the ZOA, with whom I agree, he “delivered his address before a carefully selected audience of Israeli university students not broadly representative of Israeli attitudes who would respond well to his criticism of Israel and statements about the willingness of Palestinians to make peace. In fact, he urged them loudly to pressure the democratically-elected Israeli government towards a concessionary policy on Palestinian statehood; uttered praise rather than criticism of Mahmoud Abbas’ Fatah/Palestinian Authority, which continues incitement to hatred and murder against Israel, has refused to negotiate for virtually all of the past four years, has turned down two generous offers of statehood, and repeated calls for a Palestinian state that would be Jew-free. Such a speech never could have been delivered to Israel’s democratically elected representatives in the Knesset – a venue in which he declined to speak, contrary to custom – because most of Israel understands that Palestinians are unwilling to make peace with Israel, even if that means forgoing a Palestinian state alongside Israel, and therefore they would reject his argument. In his op-ed to The New York Times on May 16, Palestinian Authority President Mahmoud Abbas blatantly made it clear that Palestinian statehood and UN recognition would not end the conflict. Rather, it combined with a [self-imposed] refugee problem would enable a more effective and efficient war against Israel, potentially by internationalizing the conflict as a legal matter, not only a political one. For example, the “Palestinians” believe it would enable the pursuit of further claims against Israel at the United Nations, human rights treaty bodies and the International Court of Justice. Oh, I don’t disagree in the slightest with anything you say above. Not for a minute do I think Obama has done a 180 on Israel and is now in your corner. Too many Jews here – not so much in Israel, I think; you tell me – got “high” off that visit and think all is well again between the U.S. and Israel. Like you, I am not fooled. But, on the recognition issue, he gave Bibi what he needed to at least maintain the status quo for now, until the situation improves for Israel. That’s the main thing. Now, Iran must be dealt with decisively. I can’t guarantee that, but I have a guarded optimism that this will come to pass. If/when it does, Obama will no longer have serious leverage over Israel at all. From what I’ve seen, it looks like Bibi knows what to do. See below.